Build of 279m² on a 855m² plot. 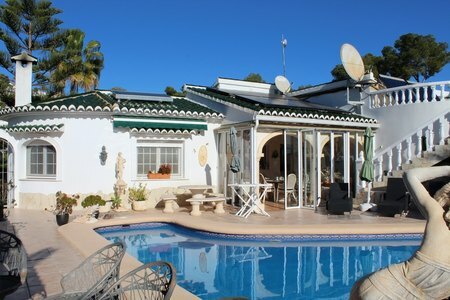 Ample villa with seaview for sale in Moraira. This refomed villa has been build on one level with the pool, to make it as confortable as possible. A drive leads to the main entrance of the house. Going up 5 steps you reach the small hall. To its right we find the good sized living room with fire place, oppsite is the spacious independant kitchen followed by the naya used as dining room, with a glass wall than can be fully opened. From there you enjoy lovely view over the L-shaped 10×10 salt water pool and the sea. Back to the entrance hall, going to the left we get to the masterbedroom with a huge open full bath-shower room, a good sized guest bedroom, a double bedroom and a family shower. The whole floor is done with black granit and with underfloor heating powered by solar and gas. The house has Wero security windows and air condition h/c throughout. The ceiling has been insolated and on the roof are 6 sun colectors and 36 sun tubes to produce enough power to heat the water for the house and the underfloor heating. Further it benefits from electric blinds, central hoover systemand automatic doors. In the huge underbuild it is possible to make a separate guest apartment. There we find the 3rd bathroom, a kitchen and a sauna. The garden is nicley planted with irrigation system and in the lower part with several fruit trees. A very well build villa with all the comfort you need to live the whole year.